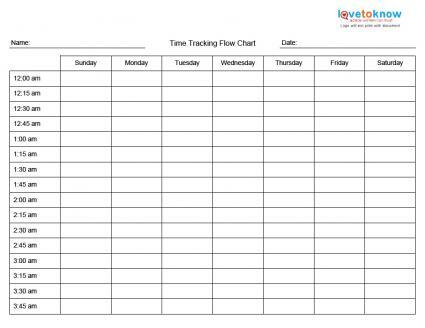 Click to download a time tracking flow chart. When you're focused on trying to improve your time management skills, you may find time management charts to be helpful tools. 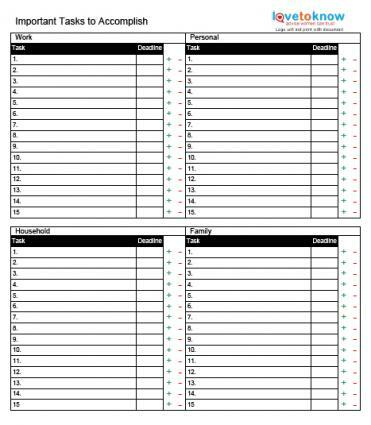 The printable charts provided here can help you figure out where you are spending your time as well as offer a framework for organizing the many tasks you need to accomplish. 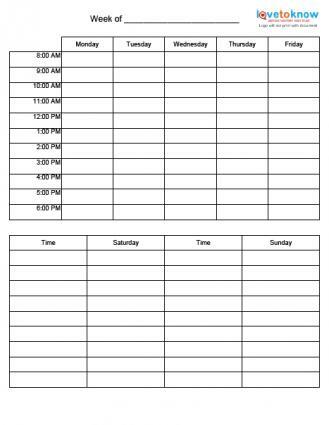 To access any of the printable time management charts in this article, simply click the image for the document that you're interested in. When you do that, a PDF document will open in a separate window. 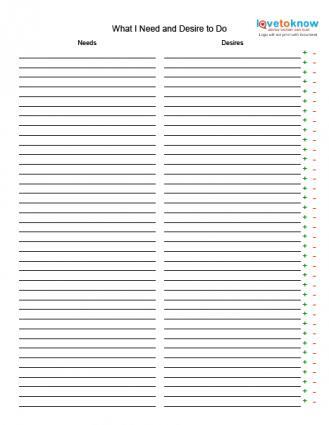 Use the menu commands to print as many blank charts as you need. 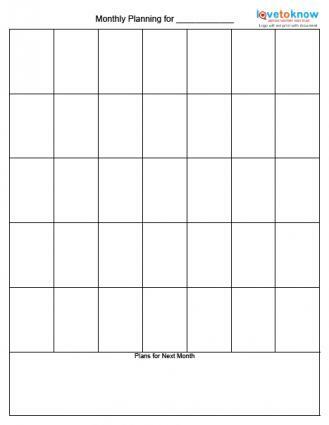 Fill them out electronically and save them to your computer for future use or fill them out by hand. If you need help downloading the charts, check out these helpful tips. The chart at the top of the article is designed to help you figure out where you spend your time. Fill in general descriptions of what you spend time on throughout the day, including sleeping, working, entertainment, family time, etc. Commit to filling out one of these charts everyday for a week, and you'll begin to see patterns emerge. Once you see where you are spending too much time, you can use time management tips and strategies to make better time allocation decisions. Make a definitive list of the tasks that you have to complete everyday using this handy chart. You can record the time you completed each one, to help you identify patterns and make scheduling decisions. Add or remove additional lines by clicking the "+" and "-" signs. 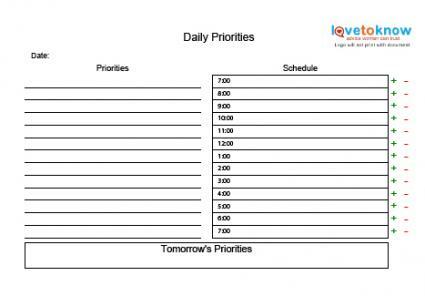 Click to download a daily duties list. Use this planning chart as a tool to set your priorities for each day, identifying the most important tasks and working them into your schedule. Click to download a daily planning chart. Organizing the tasks on your to-do list by type is a good way to let you see if your life is characterized by work-life balance, or if it's possible one area is getting so much attention that the others may be suffering. Click to download a task grouping chart. Use this chart to plan and schedule your workday and weekend activities. Using this tool will allow you to set appointments for important activities, as well as give you insight into where you have opportunities for "down" time to use to relax or get caught up. Use this blank calendar to create your own monthly scheduling tool. Record major activities for the current month, and prepare calendars for future months to use as long term planning guides. Click to download a blank monthly calendar. Use this handy chart as a future planning tool, writing down tasks that you either need or want to accomplish in the future. As appropriate, work these activities into your short term planning charts and begin making progress toward accomplishing them. Click to download a future to-do list planning tool. While there isn't a one-size-fits-all approach to getting a handle on time management, there are a number of different types of charts that can be helpful tools. Choose the charts that make the most sense for your needs and you'll be on your way to maximizing your time and feeling like you are in control of your schedule.